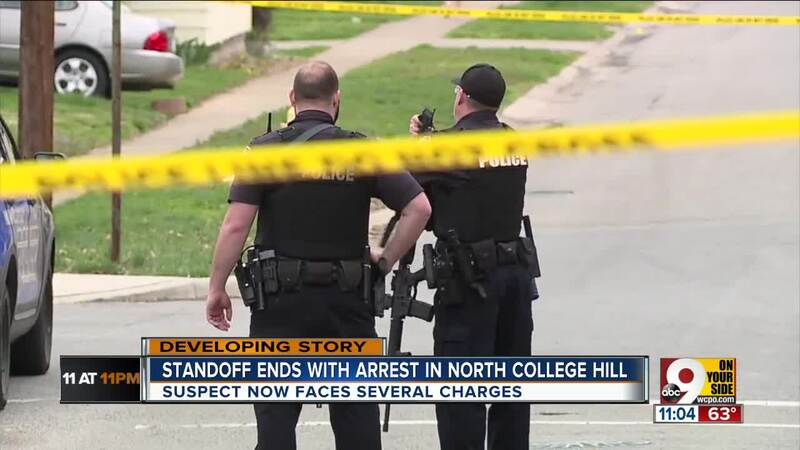 CINCINNATI — A SWAT standoff in North College Hill finally drew to a close Saturday evening after more than eight tense hours. Chief Ryan Schrand with North Collge Hill Police Department said police were originally dispatched for a domestic violence incident around 9:30 a.m. Saturday, after a neighbor called 911 and said a man inside the residence on Bake Avenue was threatening other residents inside the home. Chief Schrand said officers arrived on scene to the family running out of the home yelling at police that a man inside was going to kill them. Officers then heard "several gunshots from inside the house" and notified SWAT. The man inside the house, identified as Kelly Richards, 38, has been charged with owning a firearm while on disability, and one count of felonious assault. Court affidavit documents state that Richards threatened his girlfriend's 17-year-old son with a gun, and shot at him once as he attempted to flee. "We do believe that he did fire several rounds at the 17-year-old, trying to hit him as the 17-year-old was exiting the house," said Chief Schrand. Police worked for approximately two and a half hours attempting to coax Richards out of the home peacefully. Eventually, Chief Schrand said he stopped communicating with them, and SWAT officers utilized tear gas to push Richards out. Shortly after this, Richards exited the building peacefully and was apprehended and transported to the hospital for a minor self-inflicted gunshot wound. "They did an excellent job," said Chief Schrand. "They stayed out here as long as it took." Richards called 911 himself twice during the standoff to tell dispatchers he had shot himself, requesting that they put him in touch with his girlfriend so he could tell her he loved her. Richards lived in the house with his girlfriend and her children, who were all in the home at the time of the incident. The family ran out as police arrived, and were uninjured in the incident. "They're in good spirits," said Chief Schrand. "I think they understand. I think they're just really thankful and really happy at this point that they're all together again and nobody is seriously injured." Police believe drugs may have contributed to Richards' behavior, along with stress over his mother's recent admittance to a hospital.